Kolkata is a beautiful, confusing, historical, and powerful city in northern India. I had the privilege to join eleven other Fordham students as we learned from students from St. Xavier's College and worked alongside other volunteers at Mother Teresa's Missionaries of Charity. 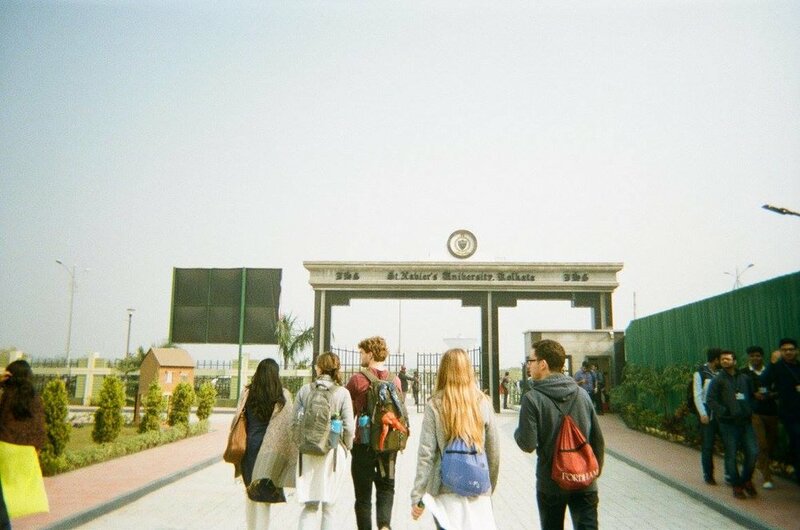 During our time in Kolkata, we learned about the history of the city and the present issues which it faces. Our friends at St. Xavier's were our guides, accompanying us to rural villages and different schools which they are affiliated. For those unfamiliar with my experiences through Global Outreach, this has been my third and final project I have participated on during my undergraduate career. (For more information on GO! and their mission, feel free to visit their website or reach out to me!) While each project is inherently different, emphasizing different cultures and social justice issues, India is set apart in its own category. For me, I often found the country difficult to understand. India is home to some of the world's oldest civilizations, yet their religions, food, music, and language are often completely unfamilar to Westerners. It's difficult to share any specific experiences in India because each requires either an in depth explanation or further details. To sum them up in a couple of thoughts, which do not do it justice in the least, would be that Kolkata is crowded, hot, polluted, and in need of investment, awareness, and a global platform. Kolkata was the capital of India during British rule from 1773-1911 and held the World's Faith in 1884. Today it sits as the 8th most crowded city in the developing world and within the top 100 most polluted cities in the world. These issues are not unique to Kolkata. In a study conducted by the UN's WHO, India has 9 of the 10 most polluted cities in the world. We spent nine days in Kolkata. While we learned a lot from the students we met and speakers we heard from, the other half of our project was working with the Missionaries of Charity. When you search "Kolkata, India" on Google, Mother House, the headquarters of the Missionaries of Charity, appears in the thumbnail as a notable feature of Kolkata. The different Missionaries of Charity houses are more than likely the only places you'll see white faces in India. They are an attraction for Westerners to come pilgrimage and serve in the footsteps of Mother Teresa. While there are plenty of issues associated with people flying thousands of miles to do the same work they could be doing in their own backyard, we won't get into that right now. Mother House is a powerful place. We had the privilege to attend mass their and join other volunteers as we set out to different locations within Kolkata. Mother Teresa, refered to now as St. Teresa of Calcutta, was only sanctified less than a year and a half before we visited. My guess would be that the little museum in Mother House will continue to see a rise in the number of visitors. While in Kolkata, we were able to experience both sides of social justice: charity and solidarity. The work which the Missionaries of Charity provide Kolkata is crucial to saving lives and assisting those unable to help themselves. While this is important, it was also important to see the work which the students of St. Xavier's are doing to help build homes and schools in rural villages. In doing so, the students are working towards solutions which will help reduce the social and physical ailments that affect the people of Kolkata. In a perfect world, the work of the Missionaries of Charity is no longer needed. That day will certainly not come in my lifetime, but it is the work of the Missionaries of Charity which inspires so many to work towards long-term solutions to our world's toughest problems. I provided a lot of details on my time in Kolkata but didn't really touch on how it made me or my teammates feel. That's a bit tougher. We reflected a lot together during our time. It's difficult to put into words the feelings which an intentional community elicit. GO! has many sayings, but the one which comes to mind regarding India is "ruined forever." I like this quote in particular because it succinctly describes a feeling of no return. I cannot forget what I saw, who I met, or how I felt after my experience. I have been "ruined" in the best way possible.